Darke County’s voting machines are rapidly aging. Legislation to fund new equipment for each of Ohio’s 88 counties is on the desk of Gov. John Kasich. DARKE COUNTY — Legislation to fund new voting machines for Ohio’s 88 counties is awaiting the signature of Gov. John Kasich. Last Wednesday, the Ohio Senate passed Senate Bill 135, which will provide $114.5 million to replace Ohio’s current voting equipment, much of which dates back to 2005 or 2006. Darke County Board of Elections Director Luke Burton said the county would receive $250,000 if the bill is approved. He said the county also would receive a yet-to-be determined amount based on the number of registered voters in Darke County. 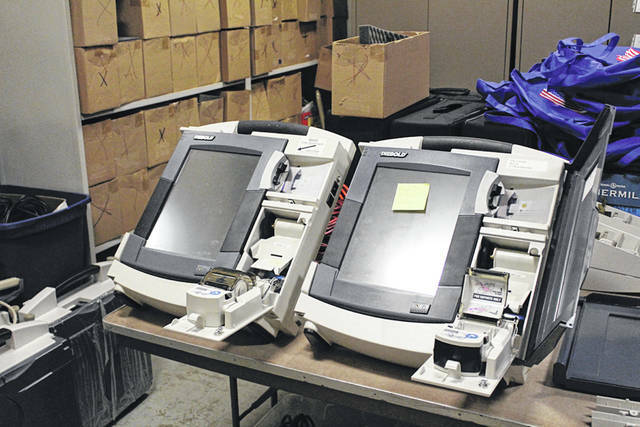 Darke County’s current voting machines, Diebold TSX models, have been in service since 2005. In 2017, Burton told The Daily Advocate the condition of the county’s voting machines are a serious concern if were are not upgraded prior to the 2020 presidential election. He estimated a quarter of the county’s 240 voting machines have undergone repairs or are no longer operable. Each county’s board of elections will have the option of what equipment they wish to purchase, if financially feasible. Burton said he and the Darke County Board of Elections have been examining options. “We have the choice of five vendors who have voting equipment that is certified by the Ohio Board of Voting Machine Examiners. We have been attending demonstrations and talking to each vendor. Soon we will being the process of eliminating some of the choices and making a decision on which voting system to purchase when we get the state funding. If state funds are available I want to have a new system in place and ready for the 2019 primary election,” he said. Burton said he and the board are taking into account a great number of factors, including the initial cost of the equipment, ongoing costs such as yearly license agreements, support and training offered by the vendor, track record in other jurisdictions, physical size and weight of equipment, programming and tabulation software, and most importantly, what is most convenient and secure for Darke County voters. “I have full faith in electronic voting machines as being secure and accurate, but there are a lot of voters who simply do not trust them,” Burton said. “Due to this, all new voting machines currently certified by the BVME have at least some element of paper to them. There are a lot of factors to take into account with choosing a vendor. If our voters will be using this equipment for the next 15-plus years I want to be sure we make the right choice the first time. “This is going to be a significant purchase, and I want to be sure that we make a fiscally responsible choice but also one that will best serve the voters for years to come,” he added. This entry was tagged election, Elections, vote, voting. Bookmark the permalink.